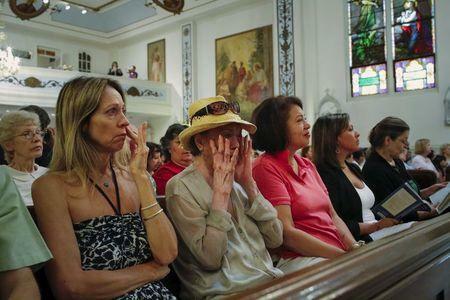 NEW YORK (Reuters) - Teary-eyed and angry Catholic parishioners across New York attended final mass services on Friday in some of dozens of churches closing or stopping regular worship services. The closures follow an announcement by the Roman Catholic Archdiocese of New York in November that it would consolidate 368 parishes into 294, reflecting a national trend of parish closures in the United States caused by low attendance, a shortage of priests and financial troubles. 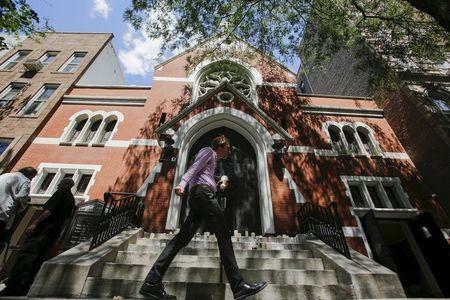 Parishioners expressed sadness at the shuttering of churches like Our Lady of Peace, a red brick church with an ornate interior on Manhattan's Upper East Side that is more than 100 years old. "It's like a death in the family," said Manhattan resident Lola Skaro, a retiree in her late 70s, who became emotional when talking about the church she had visited everyday since her retirement. Church spokeswoman and third-generation parishioner Janice Dooner Lynch said she was angry about the shutdown, which was under way during mass with workers beginning to change locks on Friday morning. "They couldn't even wait for our last mass to be over." The closures in three New York boroughs and several counties in the state come ahead of Pope Francis' first tour of the United States, which will include a stop in New York City in September. A spokesperson with the Vatican was not immediately available for comment. Challenges facing New York's Catholic parishes are experienced elsewhere in the nation, where churches have started increasingly closing since the early 2000s, said Mark Gray, a senior research associate at the Center for Applied Research on the Apostolate at Georgetown University. 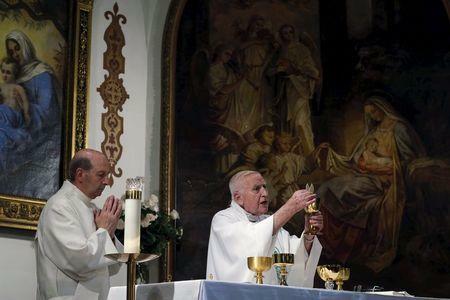 "The church's population and the parishes are no longer closely aligned," he said. The building for Our Lady of Peace will remain a church, but it will be used on special occasions only, Zwilling said. The parish has filed an appeal to the Vatican opposing the closure, Dooner Lynch said. As the last mass, about 250 parishioners packing the pews snapped pictures and patted the priest's back with affection. "It was always home for me, this place," said Father Bartholomew Daly in his homily. "So I have to say to people that you will see my ghost," he said.